California is experiencing a record breaking year in terms of its water sources; however, the supply is at a record low. 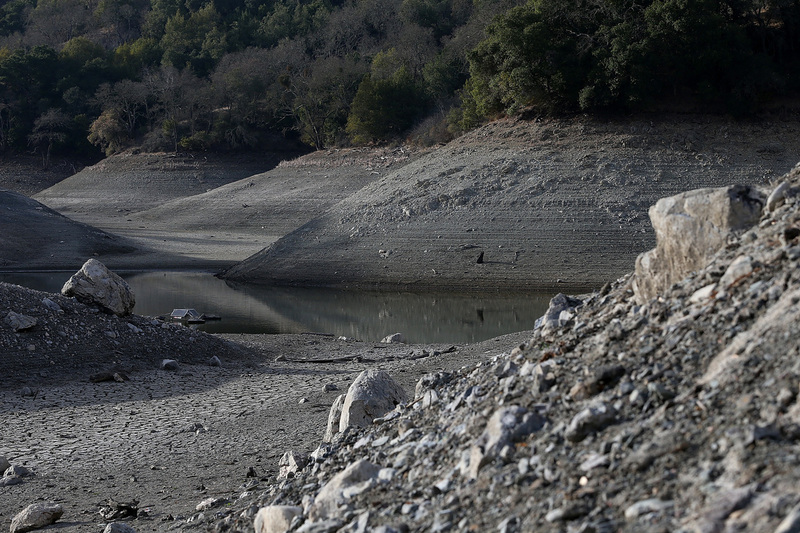 California has now entered its fourth year of scorching heat and disappearing water. This devastating drought is resulting in the loss of jobs and farmland across the state of California. The citizens of California have begun to conserve water in an attempt to find a solution to this drought. After one of California’s wettest centuries, the state enters dire straits as the drought drags on for a fourth year of record high temperatures and scant precipitation with many looking for answers as to why this may be happening. Aside from 2014 being California’s warmest for the past 119 years, farmers seek even more water as the scalding temperatures and lack of precipitation sap the moisture from their fields forcing them to scramble for more water. There is much debate regarding the cause of this drought, but many are pointing fingers to the world’s changing climate. Whatever rainfall the state needs, is being deflected by a high pressure pattern, a “resilient ridge”, which is blocking storms and pushing them to other regions such as Alaska. The state’s snow-pack accounts for nearly one third of the its supply, but due to the warmer conditions, the snow-pack is melting earlier and snow then turns into light rain causing the soil to dry out faster. The California state government has been blamed for not focusing on their water supply enough, but now they search hastily for sources to balance the water table before time runs out. According to the United States Drought Monitor, more than 80% of the state is in extreme drought. This drought has caused many issues in the area and will continue to hurt the state as the problem continues. The lack of water means farmers dependent on water to farm are harmed, and are therefore losing money, almost $810 million while their fields lay vacant. Agricultural jobs are being lost due to this inactivity. If these farmers attempt to grow crops, they pump water from the ground, which is also very expensive. For farmers that are successful in growing crops, the prices for their items have greatly increased because of the challenges of production. California produces much of the country’s fruits and vegetables, thus the increase in their prices nationwide. 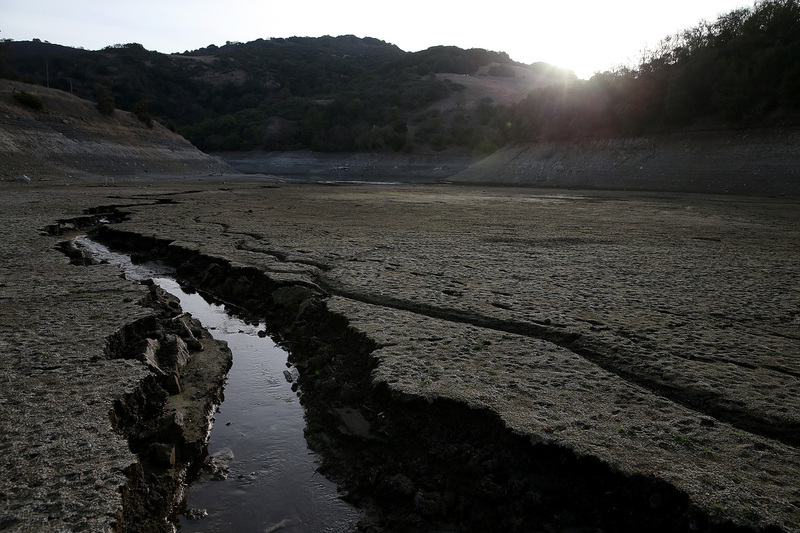 Aside from the food industry, there are other major effects of the drought. The concerns of drilling to collect more water from the ground have increased in Central Valley because of the risk of land subsidence, the sinking of the ground (A video found at this link describes this phenomena further). With the weather getting hotter and drier, there is also increased risk of wildfires. The state and federal governments are sending immense amounts of money to aid the state. Additionally, the decline in surface water flow means that there will be more issues with hydropower production, navigation, and habitat for aquatic species. However, many solutions have been proposed to resolve California’s ever-shrinking supply of water. The most prevalent of them is using drills to dig wells for groundwater. This has been used in California for decades and is often used by farmers to keep crops growing during dry seasons. However, the increased use of wells is depleting aquifers of water before they can be replenished. This damages the ecosystem, so, ironically, this makes water a somewhat, nonrenewable resource. This also causes rapid subsidence in the land above groundwater, which can damage infrastructure and increase flood risk (See this video from ABC News). Additionally, a billion dollar desalination plant in San Diego will provide safe water for 300,000 people. Despite consuming lots of energy and releasing waste products such as carbon dioxide and brine, Australia used desalination plants and their drought was ended. However, the UAE has developed solar desalination plants that would be cheaper and greener. Companies in California have developed similar systems. Another way to decrease our water usage is to grow different types of crops. Nearly half of the fruits, nuts, and vegetables consumed in the US are grown in California. By changing our diet to plants that can better grow with less water, we may be able to more efficiently produce food. As California’s drought continues to cause problems in its fourth year, California jobs and farmland as well as the rest of America are feeling the effects. This catastrophe is not man-made; however, we can aid in resolving the water crisis by doing our part. We can help by changing our habits and wasting less water. California’s landscape depends on the choices we make as a nation.